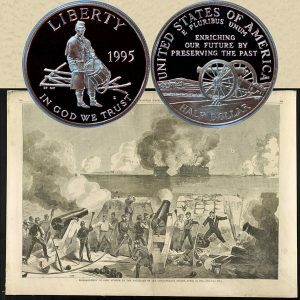 Today, the Civil War Commemorative Half Dollar Coin remembers the first shell fired on Fort Sumter in the early morning hours of April 12, 1861. Historical notes disagree on who fired the first shot. April 12, 1893, will be the thirty-second anniversary of the first shell fired at Fort Sumter, and is generally considered as the opening of the terrible struggle between the Northern and Southern sections of this great country — the one ostensibly for the preservation of the Union of these United States; the other for the maintenance of their rights under the Constitution of that Union, which they felt were being wrested from them by a fanatical element at the North. Much has been written to prove the particular individual who fired the first shell at Fort Sumter, and thereby establish the fact of a questionable honor of having inaugurated the most momentous struggle in the history of the world, both as to its duration and the numbers engaged in it, and the tenacity with which those of the weaker section maintained themselves against those of the stronger, with the whole of Europe to recruit their armies from and all the resources which their open ports afforded. I propose, as a witness to this opening episode in the great drama, beginning April 12, 1861, to give my recollection of it, along with that of others who were on the historic spot of Fort Johnson at that time, as there are but a few now left who were there and witnessed what took place thirty-two years ago, in order that when the history of this gigantic struggle may be written in after years, some items may be obtained that will assist in its compilation. In order that one not present on the spot may understand the situation of affairs at Fort Johnson at that time, I will state that there were two mortar batteries erected at Fort Johnson for the reduction of Fort Sumter. One situated on the front beach, midway between old Fort Johnson and the Lazaretto point, and directly west of Fort Sumter, and known as the beach, or east, battery (This was the most vulnerable and the weakest line of Fort Sumter), and the other was located due northwest of the former on a hill near some houses and contiguous to the present quarantine residence. The remains of this battery are still plainly visible. It was known as the hill, or west, battery. The east, or beach, battery has been washed away by the sea, but I have saved the timber that was used in the construction of the magazine. This comprises the topography of the offensive works at Fort Johnson for the reduction of Sumter on April 12, 1861. The post of Fort Johnson consisted, at that date, of these two batteries of mortars and a company of infantry as reserves, all under command of Captain George S. James, South Carolina State troops. The battery on the beach, or east, was under the immediate command of Captain James, with Lieutenant Henry S. Farley as lieutenant, and the battery on the hill, or west, was under the immediate command of Lieutenant Wade Hampton Gibbes, I think with Lieutenant J. McPherson Washington as next, and the company of infantry, as reserves, was commanded by Lieutenant Theodore B. Hayne, and was stationed near the old Martello Tower, about 400 yards in the woods, to the northwest of the hill, or Gibbes, battery. I have been thus particular in the location of the battery and its officers for reasons that will be apparent hereafter, and they are facts that cannot be contradicted. The first point to be established is from what battery was the first mortar shell fired? I will now give my personal recollections of the affair. I am a native, and was a resident and practicing physician of James’ Island at the time the first gun was fired, and consequently was perfectly conversant with the topography of the location, and having been a college acquaintance of Captain James, was invited by him the previous day, April 11, to be on hand if anything transpired to require my services. I accepted his invitation and remained to witness the first, and last, gun fired at Sumter at that time. My recollection of the matter is that on the morning of April 12, 1861, about ten minutes before 4, A. M., Captain S. D. Lee, with two other gentlemen, having just returned from Sumter, passed a group of four gentlemen, I among the number, and inquired for Captain James’s quarters, and when directed to the house occupied by Captain James, remarked on passing, that the ball would soon be opened. A short time elapsed, when Captain James and others passed to the beach, or east, battery, and Captain Lee and his party went on down to the wharf. I was midway between the houses on a bridge that connected the beach and the hill, where I could see the fire of either battery, and at 4:30, A. M., a shell was fired from the beach, or east, battery, commanded by Captain James. The second report heard was the blowing up of Greer’s house, contiguous to the hill battery, commanded by Lieutenant W. H. Gibbes, and the second shell was fired from this battery under Lieutenant Gibbes. The firing then became general around the harbor batteries bearing on Sumter. We have, therefore, the concurrent testimony of General Beauregard, who ordered the fire to commence; of Captain Stephen D. Lee, the officer extending the order; of Lieutenant Farley, who was in the battery when the gun was fired, and of the medical officer, Dr. W. H. Prioleau, who was on duty in the battery; also of Lieutenant Edward H. Barnwell, who was present at the hill, or Gibbes, battery, and of myself, who all bear witness to the fact that the first shell was fired from Captain James’s battery on the beach. How, then, can anyone claim that the shell was fired from any other point with this weight of evidence against it? As to the question of who pulled the lanyard of the mortar from which issued the first shell, there are only two living witnesses that I am cognizant of who were in the battery at the time of the fire, viz: Colonel Henry S. Farley and Dr. W. H. Prioleau. Colonel Henry S. Farley asserts in a letter to me that he pulled the lanyard by Captain James’s order, and Dr. Prioleau asserts that Lieutenant Farley had charge of the right gun of the battery, and that the first fire was from that gun, Captain James giving the order to fire, and it is reasonable to conclude, therefore, that Farley pulled the lanyard. Certain it is that either James or Farley fired it, but, as Captain James gave the order to fire, it must have been Farley, as James would never have given himself the order to fire. The order, therefore, must have been given to Farley. I, therefore, conclude that Lieutenant Henry S. Farley fired the first gun at Sumter by Captain James’s order. The Civil War Commemorative Half Dollar Coin shows with an image of the bombardment of Fort Sumter in April 1861.